Shaun Ainscough was a late replacement for Batley after Alex Brown was taken ill on the way to Whitehaven. Batley Bulldogs can take a huge step towards securing a top four finish in the Kingstone Press Championship with victory over Featherstone Rovers on Sunday. The Bulldogs are brimming with confidence having won seven of their last eight matches, with their only set-back the narrow 17-16 reversal at Bradford Bulls. 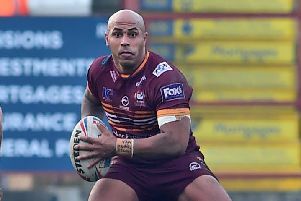 That form has put Batley within touching distance of qualifying for the Middle Eights stage of the competition, although coach John Kear continues to play down his side’s position. Kear said: “We will not start dreaming until we are mathematically certain that Featherstone and Bradford can not catch us. The team spirit Batley have shown all season was in evidence last Sunday when Alex Brown was taken ill on the coach to Whitehaven. Phone calls were made to Shaun Ainscough, who drove from his home in Wigan and arrived at the ground 40 minutes before kick off to play. Brown trained on Tuesday and a decision will be made closer to Sunday’s game whether he is fully fit to face Featherstone or whether Ainscough retains his place. Featherstone are three points behind fourth-placed Batley with three matches remaining and know defeat will end their top four hopes. July 10: Batley v Featherstone, Bradford v Whitehaven, Leigh v Halifax. July 17: Batley v London, Bradford v Oldham, Halifax v Featherstone. July 24: Featherstone v Bradford, Halifax v London, Swinton v Batley.